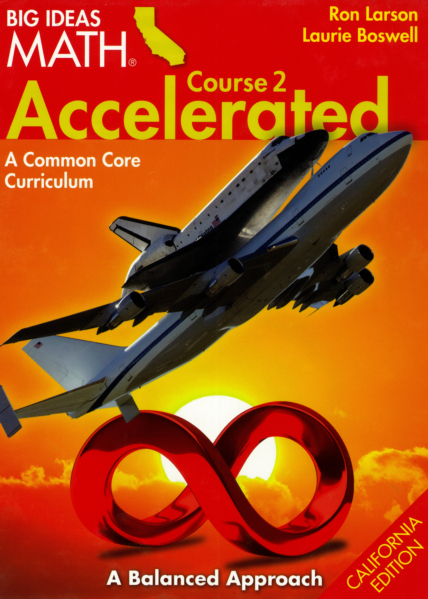 Last year, the math teachers in my department chose a new curriculum and text book series for the 7th and 8th grade math classes. They picked the Big Ideas Math series and I heartily agree with the choice. "In this version, all the word problems are about surfing and redwood trees." Instead of a traditional workbook full of repetitive practice problems, the accompanying student workbook is filled with activities, probing questions and a small number of practice problems that allow students to apply the concepts. Each section begins with an introductory activity that is frequently hands-on. In the last section of Pre-Algebra, where we explored the internal angles of a triangle, the activity asked the students to draw a triangle, cut it out, tear of the angles, put them together and make an observation. Now that we've moved on from internal to external angles, today, the students were asked to work with a partner to do something similar. The white pieces can pull off so I can put them together on the board! It didn't go as I would have hoped. After the activity (as much as we completed) we had discussion about managing class and group time. Many of the partner groups did excellent work and came close to finishing, while others had to be reminded multiple times to get back on task. Even the groups who worked well had difficulty working at an acceptable pace. I'm not sure how to attribute this issue with speed. For some, it's simply a matter of not doing the tasks, but for others, they are so scared of doing it wrong and having to start over that they move extra slowly to prevent mistakes. Interestingly, this only decreases the number of mistakes because fewer tasks have been accomplished on which to make those mistakes. The percentage of mistakes remains unchanged. The activities and problems are age/grade appropriate but are still taking too long. I told them that I want them working in groups because they learn much better when they teach and learn from each other. At the same time, they are much more attentive to the tasks when they are working individually or when I'm giving direct instruction. I can't even count the number of times I've written that last paragraph. I suspect that means it's a larger issue than just these kids in this class. Our school district just began using this curriculum this year. I teach 8th grade and noticed the same thing. I wonder if its a problem with reading and interpreting the instructions. I have had more success with these activities when I give oral instructions to the class. They still have the opportunity to do and check work with their partner, but we essentially do them as a class. I know they lose some of the discovery experience, but they also lose some of the frustration. For the activity you described above, my students still cut out the angles and rearranged them and were astonished to find that they added up to 360 degrees. When we tried another figure with a different number of sides, they were even more astonished... and then they started to figure out the pattern. I did give explicit instructions on what to do. I even had the pentagon and hexagon pre-drawn and photocopied for them. But, they did the discovery. I'm good with that. I am hoping that I will be able to release more responsibility to them gradually, but for now, I do want to be able to get to the point of the activity without running out of time and I want to cut down on the frustration while giving them that "aha" moment. "I suspect that means it's a larger issue than just these kids in this class."